Bev Tunney and Amy Schein have been best friends for years, but now, at thirty, they're at a crossroads. Bev is a hardworking Midwesterner still mourning a years-old romantic catastrophe that derailed her career. Amy is an East Coast princess, whose luck and charm have, so far, allowed her to skate through life. Bev is stuck in a seemingly endless cycle of temping, drowning in student loan debt, and (still) living with roommates. Amy is riding the tailwinds of her early success, but her habit of burning bridges is finally catching up to her. And now Bev is pregnant. As the two are dragged, kicking and screaming, into real adulthood, they are confronted with the possibility that growing up might also mean growing apart. 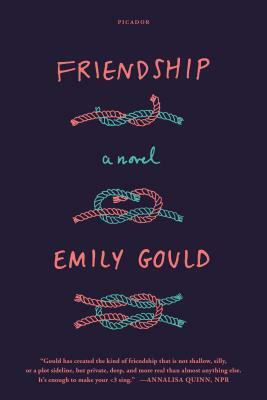 Friendship, Emily Gould's debut novel, is the story of their relationship-a searching examination of a best friendship that is at once profoundly recognizable and impossible to put down.